GEI Luncheon in honor of Ms. Kerry Kennedy, Robert F. Kennedy Memorial Center for Human Rights – New York, February 27, 2009 – Remarks by Lucio Caputo – President of GEI. I am very pleased indeed to welcome to GEI Kerry Kennedy who has been working in the field of human rights since 1981 when she investigated abuses committed by U.S. immigration officials against refugees from El Salvador. Since then, her life has been devoted to the vindication of equal justice, to the promotion and protection of basic rights, and to the preservation of the rule of law. In 1988 she established the Robert F. Kennedy Memorial Center for Human Rights, a non-profit organization that addresses the problems of social justice, serving as Executive Director and on the Board of Directors. Ms. Kennedy is the author of Speak Truth to Power: Human Rights Defenders Who Are Changing Our World, which features interviews with the most famous human rights activists and has been translated into Arabic, Greek, Spanish and Italian. Ms. Kennedy produced the premiere of the play, made from the book, at The Kennedy Center in Washington. She has since produced the play to acclaim 25 times in 9 countries and 5 languages and has appeared numerous times on major networks in the US and around the world. Ms. Kennedy is Chair of the Amnesty International USA Leadership Council and serves on the boards of directors of the International Center for Ethics, Justice and Public Life at Brandeis University, Human Rights First and Inter-Press Service in Rome. She is also on the Advisory Committee for the International Campaign for Tibet, the Committee on the Administration of Justice of Northern Ireland, the Global Youth Action Network, Studies without Borders and several other organizations. Ms. Kennedy received high honors from President Lech Walesa of Poland for aiding the Solidarity movement. She has received awards also from the Southern Christian Leadership Conference, the American Jewish Congress, the Emerald Isle Immigration Society, and the Institute for the Italian American experience. In addition she was named Woman of the Year 2001 by Save the Children and received the Prima Donna Award from Montalcino Vineyards as well as other awards and honors. Kerry Kennedy is a graduate of Brown University and Boston College Law School and received several honorary doctorate. 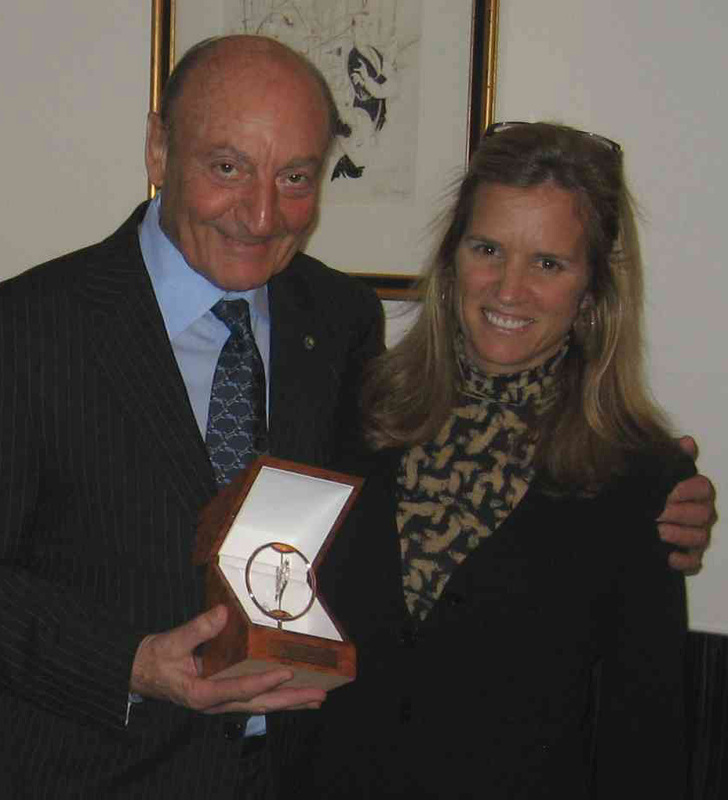 It is therefore with great personal pleasure that I present Ms. Kerry Kennedy with the GEI Friendship Award in recognition of her many accomplishments and her great contributions to the defense of human rights. The luncheon was held on February 27, 2009 in the Stella Private Room of Le Cirque restaurant in New York City.